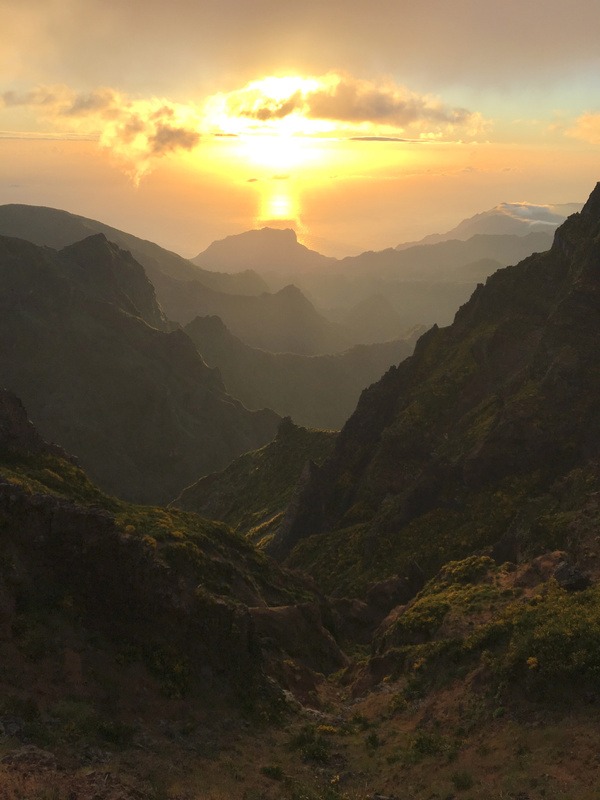 The combination of a pleasant climate with spectacular, mountainous scenery and endemic wildlife makes Madeira an attractive destination for tourists and naturalists alike. The Macaronesian island is also surrounded by bountiful seas which support thriving marine life, with cetaceans and rare seabirds at the top of the wish list for visitors. What's more, getting there is remarkably cheap. Package holidays make it an affordable and popular tourist destination. Hiring a car costs next to nothing and the small size of the island means that you're never more than an hour from the best birding destinations, regardless of where you stay. The island currently supports two endemic landbirds – Madeira Firecrest and Trocaz Pigeon – although it is rumoured that the distinctive subspecies of Chaffinch is a likely split, too. In addition to this, several highly desired seabird species are most easily encountered in the offshore waters in the summer months, not least the endemic Zino's Petrel, which may number fewer than 200 individuals. Zino's Petrel is one of the world's rarest birds, making it one of the big draws of a trip to Madeira (Josh Jones). It was with great anticipation that I headed to the island in June for a five-day visit, three of these headlined by afternoon pelagics with Catarina and Hugo of Wind Birds, the first of which was on the afternoon of our arrival on the island. The pelagics, which depart Machico aboard their trusty and comfortable zodiac, the aptly named Pterodroma, generally last up to seven hours and, in mid-summer, leave harbour at 3 pm, not returning until 10 pm, when it is nearly dark. Of course, 'comfortable' is always a relative word at sea. The seats on their boat are specially designed to lessen the impact of high swells, but nonetheless expect it to be both bumpy and wet, with regular bouts of sea spray leaving many of our crew soaked. Indeed, it cannot be stressed enough – if you struggle at sea, make sure you take the necessary precautions, not least sickness tablets. However, the fresh air ensures that the effects are offset somewhat, and the breeze generally dries you out quite quickly once you reach the chumming spot. And, of course, the multitude of seabirds is also a useful remedy to take your mind off feeling queasy! The boat was regularly accompanied by that ubiquitous Macaronesian seabird, Cory's Shearwater, while Bulwer's Petrels were common, the numbers and views far eclipsing the handful I'd previously seen at sea in the Azores, particularly on the second day, when we estimated to have amassed a total into three figures. Watching so many of these lean, rangy birds passing around the boat illustrated just how distinctive they are and there would be no issue calling the species, should one ever pass a British headland in front of me – as unlikely as that is! They seemed completely at home on the oceans, barely flapping as they criss-crossed the swells – even if their erratic style and sudden changes of direction almost suggested that at times they weren't entirely convinced by the way in which they were heading. Cory's Shearwater is abundant in Madeiran waters (Josh Jones). Bulwer's Petrel is also pleasantly common (Josh Jones). Our first Desertas Petrel was seen as we steamed out to the chumming spot on the first day, with a further nine seen throughout the afternoon, some of which gave utterly stunning views as they sped past. 'Scything' is the perfect to verb to describe the arcing of a Pterodroma – the speed at which they rise and descend really does give the impression that they are cutting through the breeze and, boy, do they look like they're having fun in the process. Desertas Petrel was seen daily from the Wind Birds trips (Josh Jones). But if the Desertas looked agile, our first views of a Zino's Petrel were something else. While some individuals can be difficult (sometimes impossible) to separate from Desertas at sea without good photos, the first we saw was a particularly small and lightweight bird that appeared barely much bigger than the Bulwer's among which it suddenly appeared. It was so fast – scything, arcing, buzzing around as if supercharged, yet looking every bit the master of its art and seemingly unconcerned by the eruption of excitement that came from the boat – 'oohs' and 'ahhs' rang out and camera shutters rang out like machine gun fire as it passed a couple of times to within 10 metres. When compared to the Desertas Petrel above, this Zino's Petrel looks significantly less bulky overall, with a rounder head shape and much more slender bill (Josh Jones). We did find other individuals more of a challenge, with some only identified after the event when we reviewed images, closely comparing them to the photos we'd taken of Desertas Petrels, as well as online resources. In total we saw five different birds over the three days at sea, four of which were well photographed – a pleasing result. Zino's Petrels show variably pale underwings, with this one towards the paler end of the spectrum, though others can be much darker, like a typical Desertas Petrel (Josh Jones). While the Zino's were fantastic, it was the bizarre pogoing of White-faced Storm Petrels that brought the biggest smile to our faces. We had singles on two of the three pelagics, with the bird on the final day lingering in the chum slick for at least a couple of hours. The flight action was something I'd read about, yet nonetheless was still unprepared for in the flesh. It is absolutely extraordinary. With barely a flap, the petrel bounces around the ocean surface using its hilariously long legs and charming yellow-webbed feet. When you combine this with its largely white plumage, rather than the brownish-black of most other storm petrels, then you are left with a unique and unforgettable beast. White-faced Storm Petrel is fairly reliable off Madeira and pelagic trips offer a fantastic opportunity to watch their extraordinary feeding action (Josh Jones). White-faced was one of four storm petrel species seen, the others being Wilson's, Band-rumped and European. With small numbers of Manx Shearwaters, a couple of Great Skuas and the local breeding Yellow-legged Gulls and Common Terns also visiting the slick at various points over our three afternoons at sea, there was plenty of variety to enjoy. And, as always when at sea, there is the element of the unknown. The Wind Birds pelagics have notched up rare species such as Swinhoe's and Black-bellied Storm Petrels and South Polar Skua in recent summers, highlighting the potential of Madeiran waters to produce rarities. Back on land, the two primary targets – the firecrest and the pigeon – are pleasantly easy to find, even on the outskirts of Funchal. The firecrest can be found pretty much anywhere where there is ample scrubby habitat, while the pigeon can be a bit more elusive, but is nonetheless still fairly straightforward to catch up with. In fact, the latter is best seen around Funchal, where birds are more accustomed to man and often show very well in hotel grounds and botanical gardens. Trocaz Pigeons tend to be quite elusive in the forested interior, but habituated birds often show well in the botanical gardens on the outskirts of Funchal (Josh Jones). The firecrests can perform well just about anywhere, but one of the best spots is Ribeiro Frio – we saw around 30 along the track up to the viewpoint, known as Vereda dos Balcões, while it's a good place for overflying pigeons and the Chaffinches perform very well around the restaurants. Also here, check the roadside verges for the endemic Madeiran Orchid, an impressively large Dactylorhiza that flowers in June and July. Madeira Firecrest can be found just about anywhere there is ample scrub on Madeira and is very common across the island's interior (Josh Jones). The Balcões viewpoint overlooks Pico do Arieiro, itself the highest point of Madeira at 1,818 m. It is here that the entirety of the world's Zino's Petrels breed and it is possible to hear their mournful wails if you visit after dark – although the footpath is quite treacherous and it is recommended that you visit with a guide. It is only when you visit Pico do Areiro in the daylight hours that you fully appreciate the scale of interior Madeira and consequently this extraordinary part of the petrels' lives – looking down the valley towards the sea, it's hard to envisage Zino's flying up and down here each night, yet that's exactly what they do during the breeding season. It also highlights just how vulnerable to extinction they remain, despite ongoing conservation efforts – forest fires are depressingly all too common on Madeira and should one engulf the colony, as it did in 2010, the tiny world population would inevitably take a huge hit. Madeira is a fantastic and affordable Western Palearctic birding destination, and the relaxed and easy-going nature of the birding makes it perfectly combinable with a family holiday. The landbirds are abundant and most of the seabirds can be seen from a land-based seawatch. However, if you want truly unforgettable experiences with the latter, and the opportunity to see an identifiable Zino's Petrel at sea, a pelagic trip is a necessity. View Josh's full Madeira photo album here. When standing at the summit of Pico do Arieiro, It's hard to imagine Zino's Petrels flying up this valley every night during the breeding season – yet that's exactly what they do (Josh Jones).